Quinta dos Roques, at Abrunhosa do Mato (between Nelas and Mangualade) was the starting point in my visit to Dão. 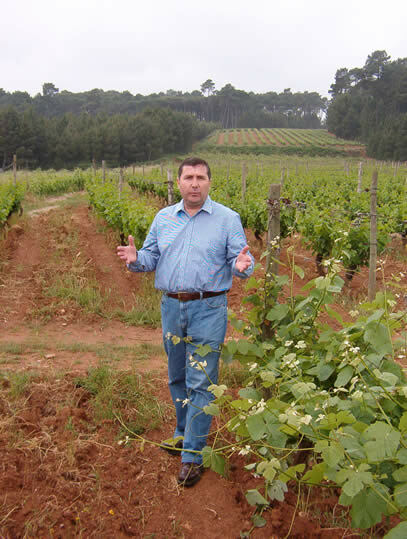 It’s a family owned company, and I was met by the owner and general manager, Luís Lourenço, and consultant winemaker Rui Reguinga. 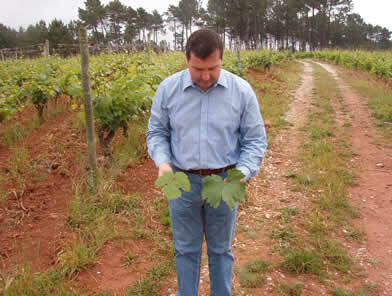 It used to be the tradition in the Dão to have red and white grapes interplanted in the same vineyard. People liked light-coloured wines, and the combination of white and red grapes helped to achieve this. From 1978 onwards the vineyards at Dos Roques were replanted and in 1990 the first wines were produced bearing the Quinta’s name. Altogether there are 40 hectares of vines here. In 1997 they bought out another Dão Quinta, Das Maias, and now own 94% of this – the wines from this estate had already been made at Dos Roques since 1992. Das Maias is a 35 hectare property at a higher altitude in the foothills of the Serra da Estrela. They control both companies but bottle the wines separately to preserve their different identities. Rui Reguinga began work here in May 2002, and has taken the quality – which was already very good – up a notch. He knows the vineyards well and has been separating the grapes from the different blocks of vines more in the winery. Green harvest is now more thorough, and the quantities of the top wines have dropped since he has been in charge. 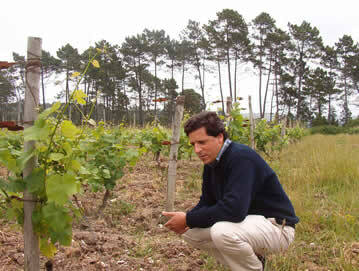 The soils at Dos Roques are mostly granitic sand, with small quantities of schist and clay. 40 hectares of vines are split between 12 different vineyards. The 1400 mm annual rainfall figure quoted by Luís is more than double that of London, but most of it falls during the winter, although there's an ever present risk of rain at harvest time. The altitude of the vineyards is around 450 m, which is quite high (das Maias is even higher at 600 m). Vine age is from 5–25 years. I spent quite a bit of time wandering around the vineyards – I always find visiting vineyards a lot more instructive and enjoyable than looking at stainless steel fermentation tanks, barrel rooms and bottling lines. The different varieties look quite different, even at this fairly early stage in their growth cycle. 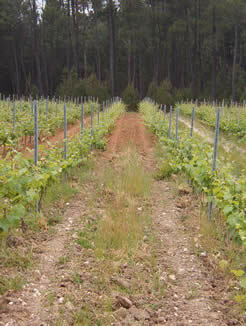 Touriga Nacional shows a distinctive, wild growth habit with shoots sticking out at all angles. Jaen has small leaves and a lovely light-green hue. Tinta Cao has huge dark green leaves. The vineyards at Dos Roques are quite modern, employing cane pruning and vertical canopy growth. Quite a few vines have been grafted across to the more successful varieties.